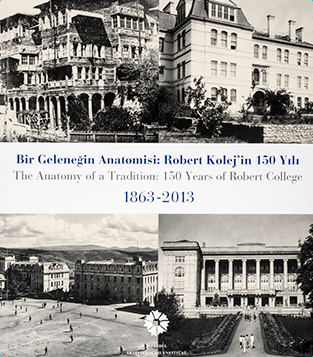 İstanbul Research Institute in collaboration with Robert College presented the exhibition The Anatomy of a Tradition: 150 Years of Robert College 1863 – 2013 at the İstanbul Research Institute on the occasion of 150th anniversary of Robert College, one of the long-established and meritocratic educational institutions of İstanbul. Robert College was founded in İstanbul in 1863 by Cyrus Hamlin and Christopher R. Robert, two men who believed in the universal value of education. It was the first American school to be established in the Ottoman lands, and outside the USA. Surviving revolutions, wars, earthquakes, fires, and epidemics, the College never closed down a single day throughout its 150-year history. Robert College has educated seven prime ministers (four of them Bulgarian), countless statesmen, writers, artists, musicians, actors, athletes, businessmen, engineers, doctors, lawyers, and educators. It has been the standard against which other schools measure themselves, even when Robert College itself had the challenge of living up to its own standards, due to lack of funding, inadequate buildings etc. from time to time throughout its history. Curated by Cem Akaş, the exhibition shed light on the 150 years of the College, as well as the educational, cultural, social and intellectual life in İstanbul through selected photographs and objects from Robert College Archives, Columbia University Rare Book & Manuscript Library and private collections.